Situated in the beautiful Mediterranean Sea, Menorca is the eastern island of the Balearic archipelago. It has a stunning coastline, with more than 120 beaches, coupled with a mainly rural interior. Mahon, the capital of Menorca is approx. 10 minutes drive from the airport. Sitting above the harbour there are stunning views, with local open markets to buy local produce. The historical town of Es Castell (with strong British influence) is approx. 20 minute drive. The old capital and port of Ciutadella at the west end of the island is approx. 1 hour drive from Mahon. 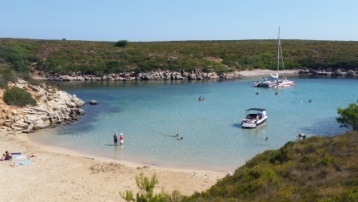 It is said there are more beaches on Menorca than Majorca and Ibiza put together! Enjoy finding your own peace and quiet, or a water park for the kids (of any age!! ).